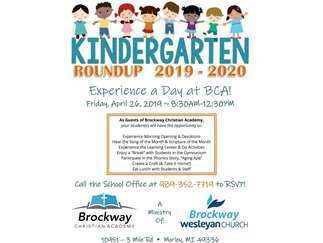 Experience a Day at BCA at our annual Kindergarten Round-Up on Friday, April 26, 2019 from 8:30AM-12:30PM. As Guests of Brockway Christian Academy, your student(s) will have the opportunity to experience Morning Opening & Devotions; hear the Song of the Month & Scripture of the Month; experience the Learning Center environment and do activities; enjoy “break time” with students; participate in the phonics story, “Aging Ape”; create a craft and take it home; eat lunch with students and staff; and more! Call the BCA School Office at 989-352-7719 to RSVP today! Brockway Christian Academy is a ministry of Brockway Wesleyan Church and is located on the corner of 3 Mile Rd and 110th Ave, just 7 miles northwest of Lakeview, 10 miles northeast of Morley, and 6 miles south of Canadian Lakes.